With a major in Communication Disorders, you can make a big difference in the life of someone challenged by speech or hearing problems. You might help a first-grader teased by classmates for her stutter or a grandfather who wants to talk to his grandchildren on the phone. Your degree will prepare you to work in Alabama’s public schools as an assistant to a speech therapist or continue to graduate school to become a licensed speech therapist or audiologist. Once completed, you may choose to work in the public school system, in a hospital, or set up your own private practice. Having Direct Clinical Experience with patients is a privilege for students. 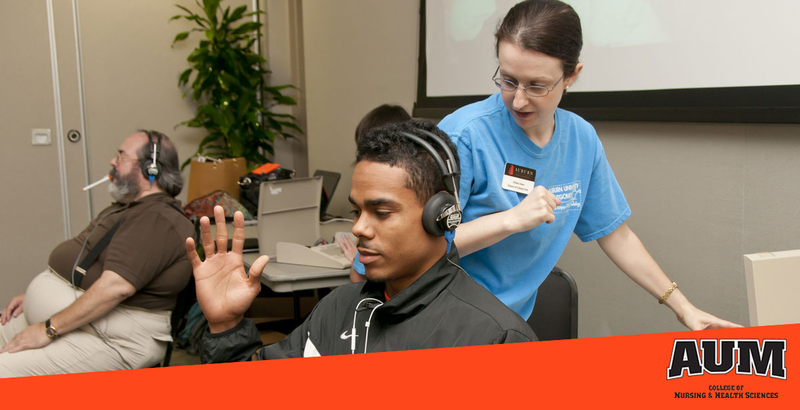 AUM is one of the few Communication Disorders programs in the country where undergraduate students have that experience. They perform these duties in AUM's own Speech and Hearing Clinic. The Clinic is the contractor of choice with the Montgomery Public Schools for children with speech disorders. This relationship gives AUM speech and hearing students experience working with children. Our program has an excellent track record in placing students in graduate school. A degree in Communications Disorders will give you excellent job prospects — with higher-than-average salaries. Employment of speech language pathologists and audiologists through 2024 is expected to grow more than 20%, much faster than the average for all occupations. And their median pay is in excess of $70,000 per year – higher than the median annual wage of all occupations. Nikki Stephens is a speech-language pathologist in the Montgomery Public Schools. Cassie Pierce is a speech-language pathologist at HealthSouth Rehabilitation Hospital of Montgomery. Jennifer Camp Gillespie is a speech-language pathologist at HealthSouth Rehabilitation Hospital of Montgomery. Kelcy Andrews will be pursuing her Master’s degree in Communication Disorders at the University of Montevallo in the fall. Emily Ballard Stewart is a speech-language pathologist with Easter Seals. Introduction to anatomy and physiology of the brain and nervous system. Relationship between neuroscience and communication disorders and hearing. Orientation and introduction to supervised clinical management of speech and language disorders. Models of language development with emphasis on cognitive-linguistic-pragmatic aspects, along with theories of language acquisition and language development from birth to adolescence. Principles of auditory reception, the hearing mechanism, and the problems involved in measuring, evaluating, and conserving hearing. Types and causes of auditory disorders and basic principles of special auditory tests for site of lesion. Orientation and introduction to supervised clinical management of hearing disorders. Hands-on learning exercises in clinical management of hearings disorders. Normal processes of mastication and swallowing to include both the anatomy and physiology of the oral motor and hyolaryngeal mechanisms, along with various problems that may occur at each stage. Assessment of the swallow and remediation techniques to be discussed. Introduction to and participation in supervised clinical management of speech and language disorders. Must take course three times. Introduction to and participation in supervised clinical management of audiometric services. Hands-on learning exercises in clinical management of hearing disorders. Anatomy and physiology of the speech and hearing mechanism. Introduction to the normal aspects of speech, language, and hearing, including physiological aspects of speech, acoustics of speech sounds, speech perception, research tools, and evolutionary aspects of language and speech. Congenital and acquired disorders of language and cognition in relation to normal development and approaches to therapeutic management of both language and cognitive deficits. Introduction to voice and craniofacial anomalies and the assessment and treatment of these disorders. The nature and treatment of the disorders of fluency. Evaluation and clinical management of speech-language disorders with emphasis on assessment techniques and therapeutic principles and processes. Advanced writing strategies in the fields of communication science disorders to include report writing in the areas of assessment and treatment and business and professional documentation. Introduction to and participation in supervised clinical management of speech and language disorders.